The American Dental Association (ADA) recommends that patients receive professional dental cleanings at least once every six months. During a professional cleaning, our trained team can remove harmful bacteria that you are unable reach through regular, daily brushing and flossing. 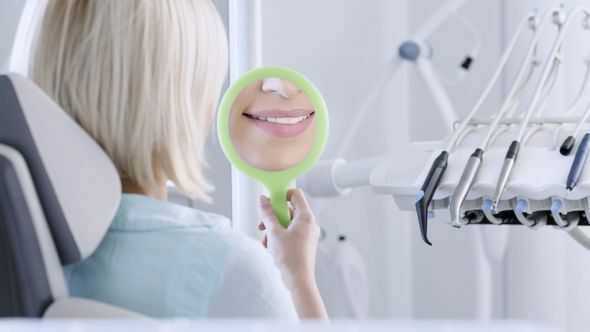 In addition, at your teeth cleaning appointment at our Red Bank, NJ, practice, Dr. Michael J. Bixby will provide a comprehensive examination to ensure you do not have any serious oral health concerns that need to be addressed. This proactive approach enables us to help our patients maintain healthy, beautiful smiles that can last a lifetime. During a regular checkup, we will thoroughly clean and examine your teeth. To begin, we use a special toothpaste and tools that will polish and buff your teeth, leaving surfaces whiter, and smoother to prevent bacteria from accumulating in the future. Our highly trained team will also examine each of your teeth to ensure that there are no signs of decay, wear, or other damage that needs to be addressed. If we see early sings of cavities, we can often restore your oral health with fluoride and other non-invasive treatments, without the need for a filling to repair your tooth. At your regular appointments, we may also take digital x-rays to assess the health of your jawbone, tooth roots, and any existing dental work. You will receive a thorough examination to evaluate your overall oral health, and help determine if there are any concerns that will need treatment. Dr. Bixby and his staff will also examine your gums and teeth to ensure there are no signs of oral cancer or gum disease. With early treatment, you can achieve far better outcomes if either of these conditions develop. Our highly trained dental hygienists are able to reach plaque and tartar you cannot remove on your own. Prevention is the best cure for oral health issues. We encourage you to maintain your oral health with regular teeth cleaning and exams at our office. We are here to provide excellent, gentle dental care. Schedule an appointment today.